Assam now seems to be following in the footsteps of several other states that have made lynching the new normal in the country. In September 2016, Assam finance and tourism minister Himanta Biswa Sarma, in response to the UK and Australia’s negative travel advisory to its citizens on Assam, had proudly declared that the state had “peace-loving people” who give “immense love and affection to all those who come here”. “Assam is a fine abode of natural beauty while its peace-loving people give immense love and affection to all those who come here. Any misrepresentation of the actual situation creates unnecessary fears besides impacting the tourism potential of the state,” he had said in a statement. Less than two years since, Sarma may need to revisit his words. In what can only be described as a barbaric act, two young Assamese men were allegedly lynched on the mere suspicion of being child abductors in the state’s Karbi Anglong district. The incident has horrified the largely peace-loving state not just because of the brutality, but also because it marks a defined departure from the kind of violence Assam has witnessed in the past. With this incident, Assam – a state, which was never quite prone to such mob, vigilante violence against its ‘own people’ – now seems to be following in the footsteps of several other states that have made lynching the new normal in the country. Sure, being a multi-ethnic and multi-lingual society, Assam has had its share of violent incidents. Ethnic and communal riots have often marred the state. The decades-long violence against ‘outsiders’ – those of Bangladeshi origin, and the Hindi-speaking population – by the United Liberation Front of Assam (ULFA) and the violent insurgency by armed Bodo outfits, demanding a separate state, had made Assam infamous. What, however, is completely alien to the state is this chilling thirst for others’ blood, as witnessed in last week’s incident. The fact that the state has not been inherently pro-violence was reflected in the gradual dipping support for ULFA. Born in 1979, the ULFA enjoyed mass support in its initial years but with its record of kidnappings, murders and extortion, it began witnessing civilian resistance and lost popularity. In fact, many in ULFA’s cadre decided to give up arms and surrendered to the government, who are now known as Surrendered Ulfa or SULFA. The larger public outrage in Assam has always been against Bangladeshi immigrants or ‘outsiders’, but even this long-simmering resentment did not have mass violent manifestations when individuals were spontaneously targeted by mobs. The 1983 Nellie massacre, which continues to be a blot in the state’s history, was a well-planned and carefully orchestrated riot. The state, however, has been hugely protective of its own identity and its own people. The protests against Citizenship Amendment Bill, for instance, opposed the bill on grounds that it would pose a threat to the identity of the Assamese people and harm interests of the indigenous people. The brutal attack on its own, therefore, is even more frightening. In the available videos, the victims are heard pleading, declaring they are Assamese and giving out names of their parents as proof. The mob, however, seems to care little, driven by some inexplicable frenzy to kill. The social media influence and the herd mentality that it brings along seems to have clearly overtaken everything else. It is evident in this case, where rumours of alleged child abductors on a Facebook page, which were further amplified through phone calls, helped mobilise locals. Incidents of mob vigilantism, seen across the country, have become viral on social media, and clearly seem to ‘inspire’ others to follow suit. Many in the tribal community in these areas are not gainfully employed. Fuelled by social media and exposed to what they are witnessing in the rest of the country, the youth is seemingly getting tempted to join the ranks. 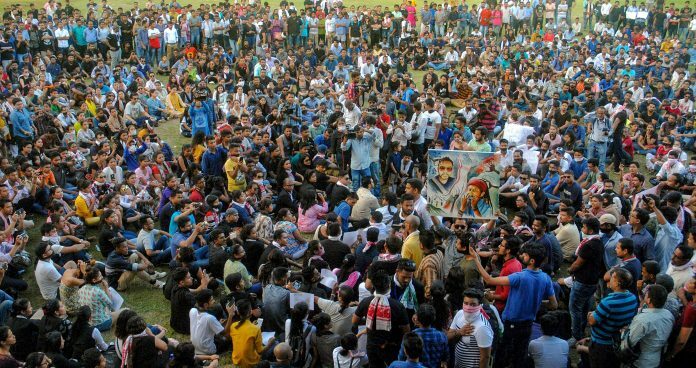 The thousands who have come out to spontaneously protest against the Assam lynching, demanding speedy justice, is an encouraging reflection of how the common Axomia is still averse to such violent deeds. The tagline coined for the state – ‘Awesome Assam’ – stands greatly diminished, given the extremely awful events of last week. Assam needs to resist the temptation to slip into this abyss, and would do well to remember the lyrics of this immortal song by the inimitable Bhupen Hazarika – Manuhe manuhor babe, jodihe okonu nabhabe, okoni xohanubhutire, bhabibo kunenu kuwa? (If we do not empathise with our fellow humans even a little bit, then think, who else would? ).